Enterprise Optimized Hyper-Converged Infrastructure - New Intel Xeon Scalable Processors Supported. The Supermicro BigTwin SuperServer systems are a family of high-density 2U hot-plug node servers available with a variety of memory capacities, HDD technologies, PCIe alternatives, networking capabilities, and GPU support options. 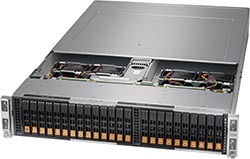 Support for the latest Intel Xeon Scalable processors enable a host benefits to each generation of the Twin architecture with: up to 3TB (BigTwin)/2TB (TwinPro) of DDR4-2666MHz ECC memory in 24 or 16 DIMM slots, flexible networking options of up to 100G, and integrated Ultra Path Interconnect technology for lower latency and extra bandwidth. 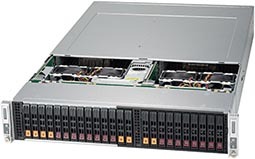 The BigTwin is the 5th generation of the breakthrough Twin architecture which extends the compute and storage capabilities of Supermicro's 2U TwinPro and 1U Twin family SuperServer systems. Offering up to 24 All-Flash NVMe or Hybrid HDDs, 2 low-profile PCI-E x16 slots and 1 SIOM slot for maximum networking flexibility, the BigTwin is optimized for today's demanded IT requirements. 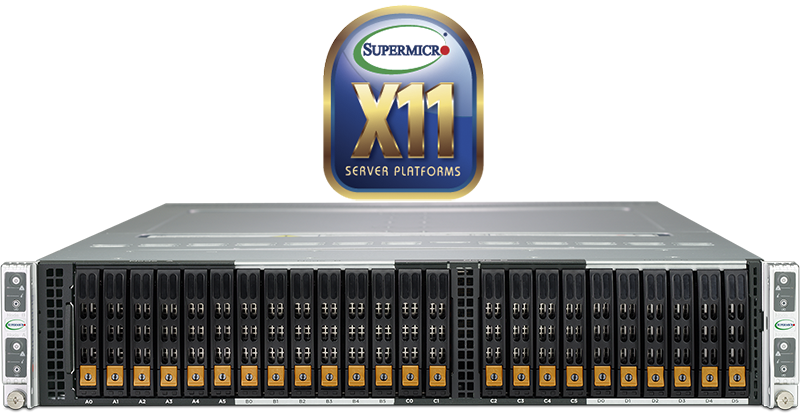 The Supermicro BigTwin represents a revolution in Green Computing designed to support customers' critical applications and also reduce Data Center TCO to help preserve the environment. Due to their shared components, the Twin Family improves cost-effectiveness and reliability over rackmount servers, while their modular architecture enables flexible configuration and easy maintenance. 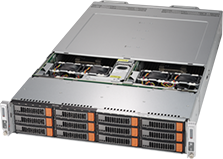 Versatile configurations and the availability of 2U form factors allow the BigTwin Servers to be optimized for many different environments including Enterprise, Data Center, Cloud Computing, HPC, Financial, Science and Engineering, File and Storage Servers.